Born in Gothenburg, Sweden in 1977 Kajsa Gullberg began thing photographs in her early teens. In 1996 she moved to Copenhagen, Denmark and studied at Fatamorgana, the Photographic Art school in Denmark and has also been educated a graphic designer at the Danish Royal Art Academy, department of Design. Gullberg’s work in striking black and white is bold and arresting. It encompasses and reflects the many layers of womanhood through the physical and the psychological, combining images of nature alongside women bearing scars resulting in a truthful depiction ofthem, their children, their hopes, disappointments and aspirations. Traditional portrayals of women are often misleading, allowing for misrepresentation of the world in which we live in. Unravelled unmasks the assumptions of beauty to disclose and appreciate a real beauty from within and in front of the viewer. Without the distraction of colour this series revels in texture and darkness whilst celebrating the depth of humanity she portrays. 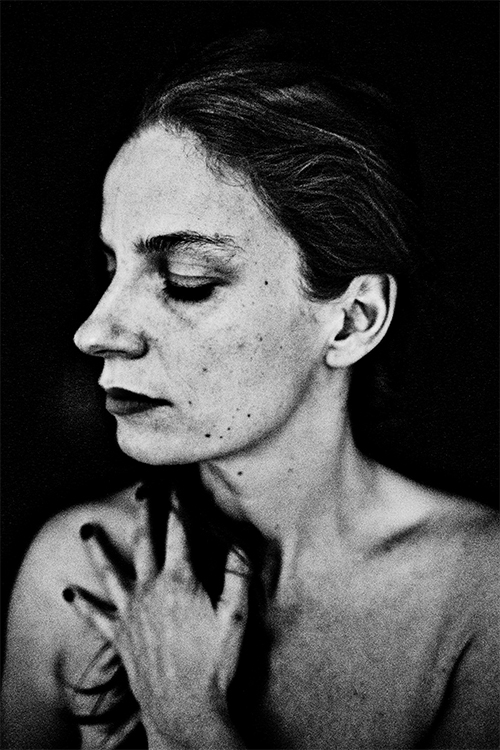 As a photographer she has published three books; Unravelled, 2014, Eyecatcher – portraits from Roskilde Festival, 2009 and Familealbum – porträtter fra Ungeren, 2007. She also gives talks, lectures, workshops and has worked as a supervisor at the Danish School of Media and Journalism.